Our experience of time is focused around what we describe as Now. Before Now, there is no time containing any realized structure, just interconnected potential actions each with variably possible chances that coalesce into becoming the actualized events that are finalized Now. After Now there are no probabilities for new things to occur. There is just the past, as a record of events that have already happened. I hope you are still with me after the twisted language in that paragraph, I have been working on the concept of time for many years. Human words were not designed to discuss the structure of time, itself, so we will begin exploring what words imply. Fig 1 is our picture to help focus the discussion. The flow of an activity is from right to left in the picture, with Now being the focus of where things happen. Future (or potential), the assembly of all the possible ways potential events could happen. Reality happens when the amorphous ensemble of possibilities converge into actual events. So the future is the potential for all that could happen,not a tangible, real condition. Now (or becoming), the location where all the myriad possibilities solidify into real and unchangeable events. This coalescing of all possible actions into real events has been called the ‘glowing,’ or ‘burning’ edge of time. It is where new actions form and our awareness happens. The flow of time does not stop because there is no firm paved path to walk along. Time flow occurs because there newly crystallized events that becomes the new Now. This picture means that the future is not predestined, that it is the myriad formless ways that things could happen. Fig 2 Potentials condense into events, Now. Fig 2 continues the conceptualizing with a possible picture of the Now boundary between Future possibilities and the unchangeable past, to illustrate this condensation into actuality. Past time → Future time. But the flow comes from the right of our image, as –during our perceived Now–the possibilities of future activity solidify into (become) actual and unchangeable events. Fig 3a This is what we experience Now . Fig 3a is Now. Picture yourself riding in a car along a divided highway. Right Now, we are approaching an overpass with traffic in front, and an SUV entering from the right. Fig 3b is how would we picture this from a point in advance of Now, watching the ensemble of potential occurrences meld into the becoming reality of 3a. whether people decide to enter the freeway or take an early exit. As potentials flow into Now, such decisions made even moments ago (in the past) affect how probabilities become resolved Now. Will any particular person be in 3a? If so, will she be in front or behind the taxi? 3a is the actualized Now recorded by a photograph, but it is only one of the realizations that might have been. So this is our picture. The future is not a reality because of the huge array of possibilities in what could become the real Now. Human language tenses are not built for time travel (we said that before! ); we cannot use usual time-related words for the future – would clock time even apply? 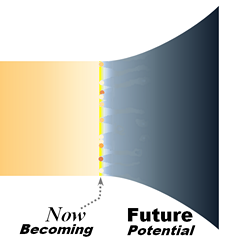 We do apply “flow” to describe our future, but what is flowing is a bit unclear. Maybe flow would indicate the changing probability assigned to any possibility? We also minimize the use of ‘probability,’ because this word currently has a well defined meaning. But What Could The Past Be? Fig 4 is the full time path picture showing small subset of events, out of the smooth uncountable actions that continuously become real. The fully realized events are colorized to show that events fade into the increasingly murky background – events become more difficult to identify as they recede into the distant past. The horizontal direction ( ↔ ) is the time path: Now indicates zero elapsed time, distances to the left would be measured in minutes, years, millennia, … whatever time units are appropriate for a discussion. Fig 5 shows that vertical slice ( | ) across the time path would not be a straight line, actually; it represents the 3 dimensional instantaneous image of the universe at that slice. We refer to such 3D ‘lines’ as slices, boundaries or membranes. The Now as we have discussed is a natural instantaneous slice, of no duration (length along the timeline) but including all we can perceive. You actually do this when you discuss what happened at 11:05 in the morning 2 days ago. For that, your membrane encompass all events in the entire world and outer space, as far out as one must to “isolate” the interesting thing that happened then. We have discussed our overview of the structure of time. Our next post in the time series examines the details of the Fig 5 visualization to perceive the limits to our knowledge of how the world has evolved into what we see today. This is the 5th note on our picture of time, and the 1st in theTime Path Ontology chain. The first, Ideologies Don’t Work, pointed out that the absence of time travel over the history of the human species meant that it does not exist. It also says that since we cannot get messages from the future, no ideology can work to force the world to “just do the right thing.” The fourth, Fortunetelling Killed by time’s arrow, points out the absence of legitimate seers in human society. This does not mean there would be no survival benefit to foretelling the future, just that there is no future to read. We also discussed Niven Law for time travel. This entry was posted in General and tagged becoming Now, being and becoming, being Past, Ontology of time, picture of time, potential Future, Time, time line, time path. Bookmark the permalink.